Edward Hughes was a British Victorian artist who specialized in genre scenes and portraits. Edward lived in London and most likely received his training under the guidance of his father, the landscape artist George Hughes. 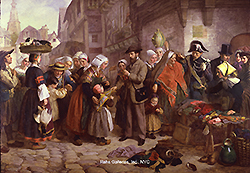 The ability to show Victorian people in very accurate, realistic, everyday scenes – whether it be at school, church, home, or abroad – was the main goal of the genre artist during this period. Hughes, at his best, was among the finest England had to offer. During his lifetime he exhibited a number of paintings at the Royal Academy, British Institution, Suffolk Street, and Grosvenor Gallery.